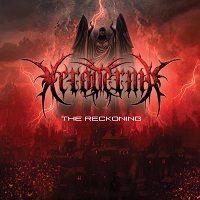 In the past couple of years we have seen that the Death Metal sub-genre of Metal has started to grow rapidly, with the decline in Deathcore and the rise of real old fashioned Death Metal we see a band formed in 2009 release in 2015 their debut album entitled “The Reckoning”. Straight to the point and efficient in terms of fast and powerful chords and beats which come together to create the records first track, I would say that the track itself is solid and evolves as it continues onwards, at the same time you can hear areas of melody and progression which work together perfectly in a smooth harmony of heavy and continuous creativity which really forge perfectly. I would say that with how this track is going it takes a faster side to new age Death Metal but keeps the traditional areas of the sub-genre's legacy. I would say that the track holds more melody than any of the other tracks presented on this record; at the same time it holds some earsplitting riffs which just dig deep into the temples of the skull and really take hold, with that said it is interesting to see what the band have presented before us, showing some technicality and intense power chords which work together in a perfect way. With the tracks progress so far we see the vocal styles change in higher ways in certain parts of the song showing just what the guys in XERODERMA are capable of. I'm not going to lie here folks but the way the track opens has a very Black metal feel going on here for the songs opening, reminds me of early EMPEROR in a weird, yet wonderful way, though the band have presented a more Death Metal record there seems to be a more Black Metal inspiration going on in the song which shows that the members hold some inspiration from within different branches of the extreme metal tree. Besides this, we see the band go beyond creative with the chords and solos locked inside of this song's structure. From the title itself you would have thought that the band would have covered the classic track by VENOM; instead we have something which starts of slow and builds up to a thundering crush to the floor. The song holds more of a Death-Black Metal feel which takes a lot of time to get at first but as it continues we see the bands ideas and creativity flow in between different sections of the song as it continues, though I am starting to feel if the band should present themselves as a Prog Death Band as the entire record seems to flow in those areas quite well and really present it that way if I may be so honest. A crushing and brutal vibe is how the track opens, almost like the feel of a fist between the neck muscles to be honest but at the same time a take back to the first few tracks on this record, a pummeling tone and idea I must say, but I won't lie when I say that I did prefer the previous songs as it to me showed what this band was truly capable of when they worked on chords and bass tones with which I feel made the record shine even more. Through the record I feel that these are the tracks that really stood out the most from the eight and I feel that they are a perfect representation of the record's ideas and construction.